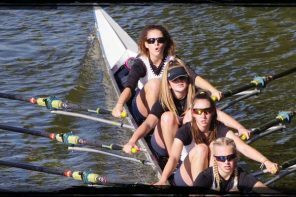 The Henley Junior and Senior Women’s Squad took seven wins from the first Head race of the season at Wallingford Long Distance Sculls on Saturday. The first Henley win of the day over the 4,250m course came from the WJ15 quad of Ruby Brown, Georgie Robinson Ranger, Eve Poulter, Issy Jonsson and cox Gemma Sarney. The WJ16 double of Ella Morgan and Florence Wiggins soon followed with the second win against the field of sixteen doubles. 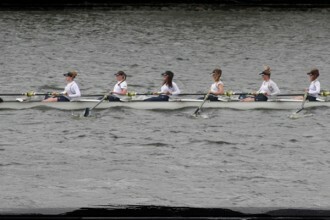 In the WJ18 singles, Hattie Orr won in a time of 19 minutes and 57 seconds in a field of sixteen scullers. In the afternoon session, the WJ18 quad of Lauren Edwards, Katy Claridge, Ellie Thompson and Hattie Orr put an early marker down for the season ahead with a triumphant time of 17 minutes and 2 seconds, leading the field of junior and seniors with the fastest women’s quad time of the day. The WJ16 quad of Ella Morgan, Clare Pearson, Maisie Turner and Florence Wiggins put a similar marker down for their age group to score the fifth win of the day in a winning time of 17 minutes and 12 seconds. 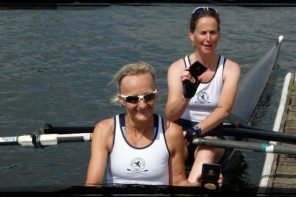 The sixth win came from the newly-formed `WJ15 double of Lottie Orr and Mary Wright in a time of 18 minutes and 55 seconds. The coxed quad of Alicia Redman, Ella Wandless, Rachel Alder, Emma Lister and cox Rebecca Lister scored the fastest time in the Women’s Novice quads event to take the seventh win of the day for the Henley club.